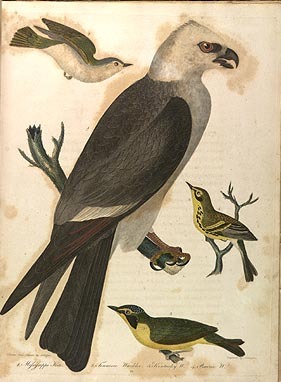 "This hawk, though wounded and precipitated froma vast height, exhibited, in his distress, symptoms of great strength, and an almost unconquerable spirit. I no sooner approached to pick him up than he instantly gave battle, striking rapidly with his claws, wheeling round and round as he lay partly on his rump; and defending himself with great vigilance and dexterity; while his dark red eye sparkled with rage. Nothwithstanding all my caution in seizing him to carry him home, he struck his hind claw into my hand with such force as to penetrate into the bone. Anxious to preseve his life, I endeavoured gently to disengage it; but this made him only ontract it more powerfully, causing such pain that I had no other alternative but that of cutting the sinew of his heel with my penknife."